Festus keyamo, spokesman of the reelection campaign of President Muhammadu Buhari, has asked Nigerians not to join ex-President Olusegun Obasanjo in receiving the curse he allegedly invoked on himself over former Vice-President Atiku Abubakar. But Obasanjo went back on his words on Thursday when he endorsed Abubakar after saying his former deputy had asked for his forgiveness. Reacting to this, Keyamo accused Obasanjo of using the name of God in a flip-flop manner. “Interestingly, just a few weeks ago, specifically on the 4th of August, 2018, Chief Obasanjo was widely reported to have said “God will NEVER forgive me if I support Atiku for President”,” Keyamo said in a statement. “Whilst we acknowledge the constitutional right of the ex-president to support anyone of his choice, we draw attention of all God-fearing Nigerians to a character who would use the name of God in vain and in a flip-flop manner in just a matter of weeks. Where is the shame? Where is the honour? Where is the pride? 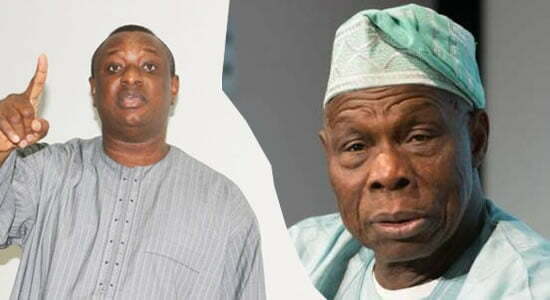 Keyamo wondered why Abubakar preferred to beg Obasanjo rather than present evidence that he is not guilty of the allegations levelled against him. He said while Buhari depends on the endorsement of Nigerians, his opponent was relying on the support of those who think they can continue to choose people who will govern Nigeria. “However, we are bemused and amused that a character who intends to be President of Nigeria has, for the past eleven years, consistently begged for “forgiveness” from a man who has consistently and unequivocally called him a very corrupt fellow,” he said. “We wonder what type of character would not vigorously confront his accuser with facts to show his innocence, but would rather consistently ask for “forgiveness” from him. “The desperation to get the endorsement of Chief Olusegun Obasanjo by the PDP and its candidate is a clear sign that they want to return us to our sordid past where a few people decide who should govern us. He also tackled David Oyedepo, founder of Living Faith Tabernacle; Mathew Kukah, Catholic bishop of Sokoto diocese; and Ahmad Gumi, Kaduna-based Islamic cleric, for accompanying Abubakar to Obasanjo. “We also note with interest the full participation of some “men of God” in the entourage of the Peoples’ Democratic Party for this political re-alignment,” he said. Erudite Silk Festus Keyamo, you really don’t need to bother yourself, Nigerians are very wise people and have even become wiser having tasted the sixteen wasteful, lost locust years which PDP represents and the more than three years committed, sincere re-building efforts of my beloved PMB and his APC. No right thinking Nigerian is taking Olusegun Obasanjo seriously anymore. As for me, my legs are touching my head in my running away, in the opposite direction, from Obasanjo, his self-inflicted curse and all!